I am a cleaning ninja. Running full tilt, I launch off a ledge, over a pit, flip through the air and with a slash of my broom I brush through a woodland creature controlled by the dust that clings to it; with the momentum of the slash, I just barely gain enough speed to fly through a small, spiky gap, sliding down a wall on the other side before leaping just in time to avoid a razor sharp barrier and landing on a narrow platform nestled between two spike pits. That took me five or six attempts before I got it right. Dustforce is elegance in motion. This 2D sidescroller will have you mastering the double jump, the air dash, the combo-jump, and many more classic platformer techniques throughout its impressively large array of levels. What’s most remarkable, more than the clever level, character and sound design is that never once did the controls feel clunky or obtrusive. Controls in gaming work like a language: in some, fluency is difficult, but in others the controls come so naturally they may as well be your native tongue. I was so baffled with how quickly Dustforce’s mechanics became second nature (with best results when using an Xbox 360 controller for the PC) that I actually brought in a less experienced gamer to see if they could just as easily pick up the game and play. To my delight, my friend was putting me through my paces, beating my scores and advancing further than me in no time. That’s just how easy it is to pick up this game and play, despite its arguably complex control scheme. Levels task you with cleaning the dust, leaves, trash and eventually toxic waste from a plethora of settings. Playing as either a blue janitor, a red female groundskeeper, a purple dual-feather-duster toting maid, or a green scruffy old man with a vacuum, you must dodge, duck, dip, dive and dodge your way through increasingly complex mazes of platforms, spikes, and unique enemies. The game’s soundtrack keeps you calm and relaxed, which is good, because on harder levels you’ll be tearing your hair out trying to figure out how you are supposed to vault through a tiny hole 30 feet up a wall that has a spike pit on the immediate other side. But you will love it. When you finally beat that level that’s been killing you for ages, a sense of pure elation comes over you. That’s the sign of a great platformer. The sensation that even though hundreds, even thousands of other people have completed that level before, none could have possibly done it with such grace and style as you just did. It’s the kind of feeling that makes games worth playing. 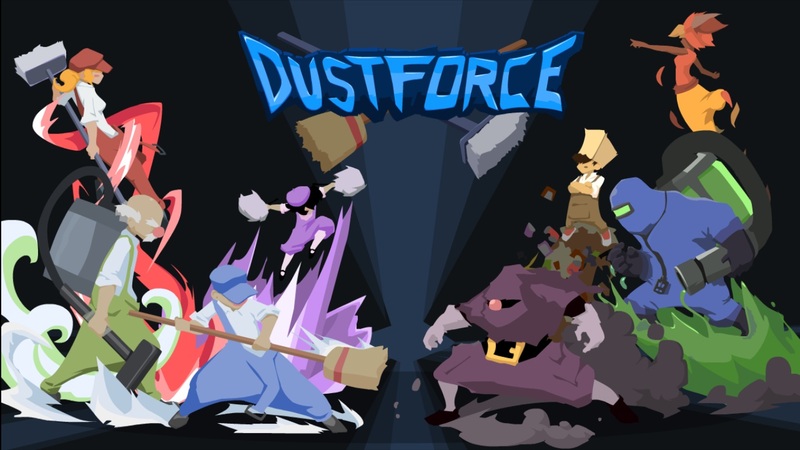 Dustforce is available on PC, Mac, and Linux for $9.99, but will be coming to PS3, Xbox 360, and PS Vita in the near future.